In March, CB Insights created a timeline chronicling four years of retailer bankruptcies, from Radio Shack to Sports Authority, to Radio Shack again, to Toys ‘R’ Us. The timeline is noteworthy because it’s full of household names. One thing they have in common is that with one exception, none were beauty retailers. In fact, growth in that category is outpacing that of apparel and footwear, according to Euromonitor International. What are they doing so right? Failure to embrace digital transformation is a death sentence for retailers. Consumers expect their experiences to be seamless and personalized. Beauty brands get that because, well, they have to. Personalization is crucial in this category because the product is inherently personalized. There are countless factors that determine how cosmetics look on consumers, given everyone’s different face shape, skin tone, and complexion. 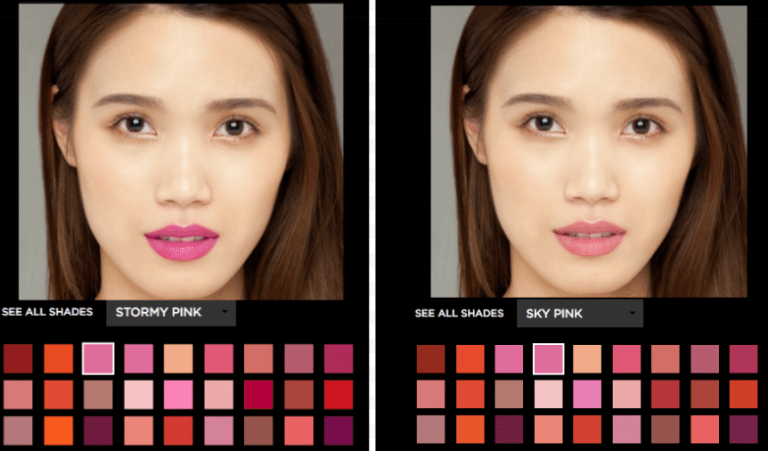 Revlon sells two shades of pink lipsticks that look interchangeable on the website. See how different they look on the model? Unless you’re her identical twin, there’s no telling how pink each one will look on your face. To solve that problem, beauty brands are investing in technology to help facilitate personalization. More and more of them have chatbots that dole out advice and augmented reality fitting rooms. Sephora—which ranked first in the inaugural Retail Personalization Index by Sailthru, where, full disclosure, I work—was a pioneer there. Similarly, in March, L’Oréal acquired ModiFace, an company that’s been involved in incorporating AR into several beauty brands’ apps, including Sephora. Department stores are creating more personalized experiences for cosmetics customers, as well. Target’s new Beauty Studio involves an AR fitting room that works in-store, as well as on its website and mobile app. Saks Fifth Avenue is also expanding its beauty department to include in-store spa services and concierges who can guide customers through the potentially overwhelming department, which sells 122 different brands. It’s not enough to invest in emerging technology; you have to know how well it’s working. Measuring the effectiveness of marketing technology is difficult for 46% of marketers, according to research by Adestra, which surveyed companies that describe their digital marketing plans as best-in-class. L’Oréal brought its ad-tech stack in house and more recently, developed a tool called Cockpit to measure the ROI and productivity of digital media investments, allowing the brand to see what’s working… in real time. Cockpit tracks more than 20,000 data sources with metrics including share of voice, fraud, viewability and cost per click. Sephora has also broken down its silos by combining its digital and in-store teams last fall. That makes it easier to build customer profiles, which collect data on browse and purchase history, and interactions with sales associates. When someone gets an in-store makeover, the employee logs every product he or she does and sends it to the customer’s app, allowing them to recreate the look on their own (and buy the products). Research and Markets projects the global cosmetics market to grow to $429.8 billion by 2022, up 4.3% from 2016. And of course, Amazon factors into that huge figure. The ecommerce juggernaut’s beauty sales have grown by 30% during this year’s first quarter. However, that growth isn’t necessarily happening at the expense of the brands themselves. Ulta, the largest beauty retailer in the U.S., has increased its market share from 1% to 4.2% over the last decade, and is projected to keep growing. One thing that sets Ulta apart is a particularly robust loyalty program. Ultamate Rewards is free and entitles members to birthday gifts and double points for that entire month. Spending more unlocks tiers of membership, which include more perks. Named for an Italian economist who noted that 80% of the country’s land was owned by 20% of the population, the Pareto principle is better known as the 80/20 rule. For retailers, that means that the majority of sales come from a small group of dedicated customers. The margin is even narrower for Ulta; 90% of the brand’s sales come from Ultamate Rewards members. As long as beauty brands continue to invest in the customer experience of the future, they’ll continue leading the way when it comes to digital transformation. That leads to greater loyalty, even as Amazon aggressively encroaches on their turf.